Black Panther, the movie, catapulted Afrofuturism and Black ideas of alternative future into the mainstream. For many viewers across the world, the movie was the first time that they were exposed to Afrofuturism in a palpable, experiential way. But as Reynaldo Anderson of the Black Speculative Arts Movement (BSAM) contends, Afrofuturism and Black futures have been around for a long time, even as they have only began going mainstream in the last decade. Anderson was born into a military family and grew up in a household exposed to Jazz, and his mother encouraged him to read comics. He also was a fan of the R&B group Earth, Wind and Fire, and Parliament Funkadelic. GRIOT speaks to him, founder of the Black Speculative Arts Movement: a network of creatives, intellectuals and artists working around “Black digital futures” and a yearlong series of events and symposia across the world. Ahead of the European leg of the BSAM event series, Anderson explains what speculative art is, common misconceptions around Afrofuturism and what one can expect at the forthcoming events in Berlin, Rome, Bilbao & Birmingham. Griot: How would you describe speculative Art? 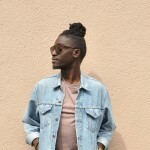 Reynaldo Anderson: Basically, Black speculative art is a creative, aesthetic practice that integrates Afrodiasporic or African metaphysics with science or technology. It essentially seeks to interpret, engage, design, or alter reality for the re-imagination of the past, the contested present, and act as a catalyst for the future. For example, the literature and visual art of Tim Fielder, Milton Davis and Nisi Shawl re-configure the past with Steamfunk or Dieselfunk expression. Other examples are the visual art of Kapwani Kiwanga, Quentin Vercetty and Osborne Macharia who also reinterpret African culture and history with an eye on the future. What is the most common misconception about Afrofuturism? In my experience, the most common misconception about Afrofuturism is that it is a recent phenomenon, but Afrofuturism is only the most recent description that has been given to what we call Black Speculative thought. 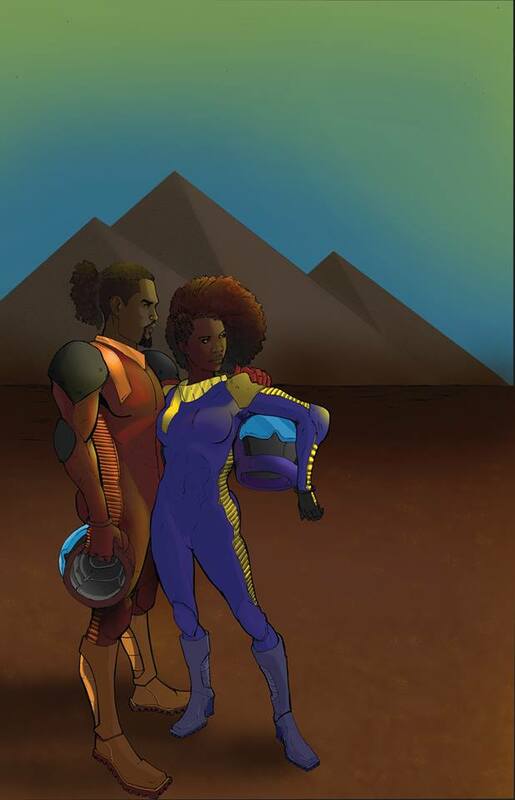 Current Afrofuturist thought in the American African Diaspora traces its origins to the mid-19th century and early 20th century proto-Black speculative works of Martin Delany, Pauline Hopkins, W.E.B. Dubois and others. The Black Speculative tradition emerged out of the nexus of the Industrial revolution, scientific racism, and the transnational Western and Arab slave trade. The purpose of the creators of the Black Speculative tradition was to project a Utopian vision of Freedom as an antidote to White supremacy, while its Eurocentric counterpart, science fiction, promoted Progress. 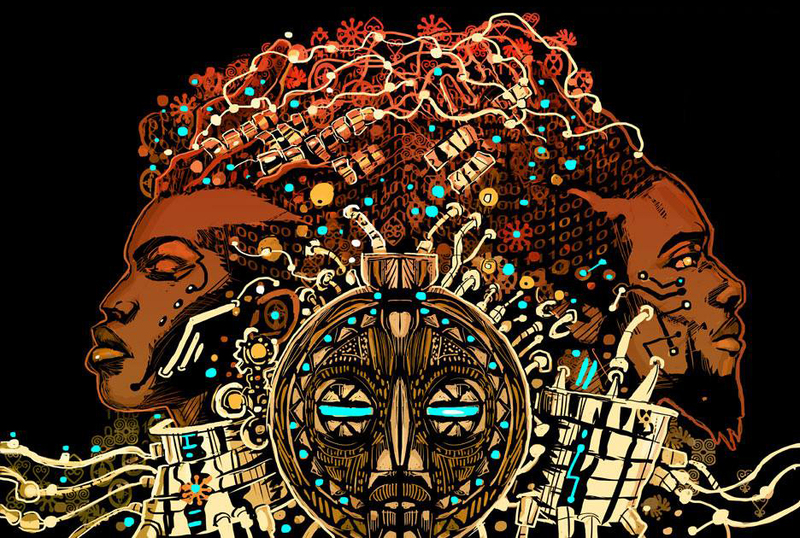 How is second wave Afrofuturism distinct from the first wave? An initial wave of scholars and creatives like Alondra Nelson, Kodwo Eshun, Paul Miller, Sheree Rene Thomas, Anna Everett, and others formed the Afrofuturism mailing-list in the 1990s. 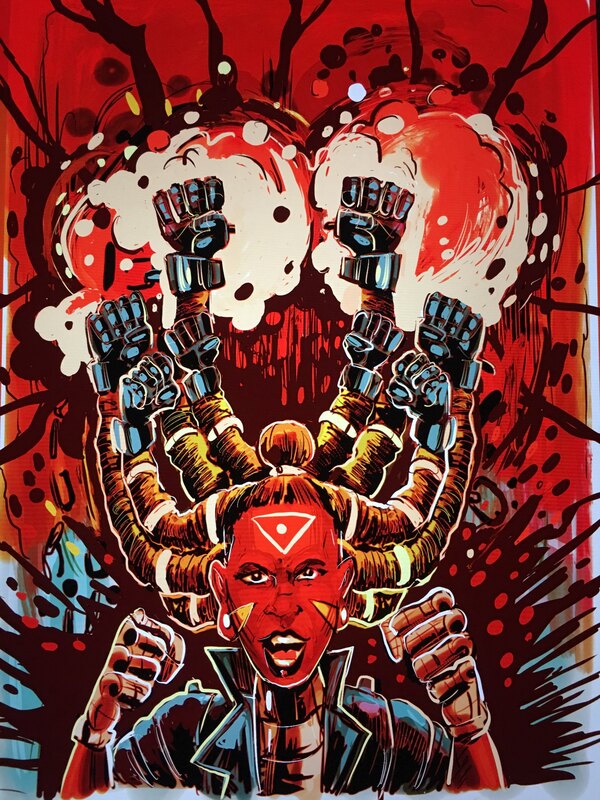 Other creatives like the developers of Milestone comics, and members of the Detroit Techno Collective, Underground Resistance, were the vanguard of a generation to advance futuristic notions around culture and the digital divide. However, since 2005, the second wave of Black futurity or Afrofuturism 2.0 emerged from the nexus of events surrounding the emergence of social media platforms, the rejection of neoliberalism, the collapse of the Washington consensus after the economic collapse of 2008, rising fascism and authoritarianism, global migration flows and the transition to a multipolar post-American world order. Sun Ra, the avant-garde jazz band leader, emerged in the late 1940s and early 1950s. Ra drew from ancient and occult texts, heretical re-readings of the Bible, and the esoterica of 1950s black Chicago, including a dialogue with pamphlets circulating from early believers of the Nation of Islam, developing with his outer space mythology, a cosmology and cosmogony that sought to re-position the Black man in the cosmos. Ra influenced the groups like Earth, Wind and Fire, Parliament Funkadelic and others. The current wave includes other scholars and creatives like Nettrice Gaskins, Natasha Kelly, Ifeoma Okoye, The Afrofuturist Affair, Afroflux, Tim Fielder, Lonny Avi Brooks and Duane Deterville. Afrofuturist collectives in Canada, Brazil, the UK, France, Ghana, South Africa, Germany and Kenya have emerged to the point where Afrofuturism 2.0 is now an emerging Pan-African transnational, trans-contextual, technocultural social philosophy characterized by other dimensions that include metaphysics, aesthetics, social sciences (such as Afrocentricity), theoretical and applied science and programmatic space. What do you mean by “movement” and why is Afrofuturism so popular at the moment? 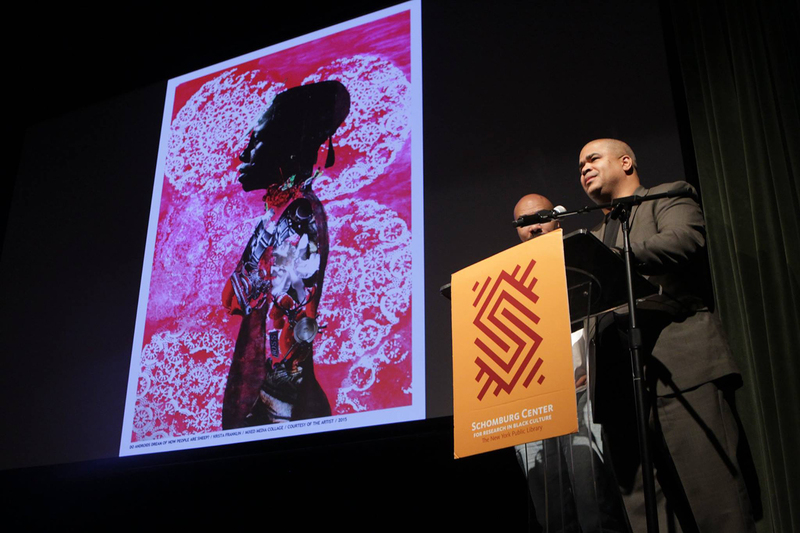 As a movement, the Black Speculative Arts Movement (BSAM) is not a unified school of thought. BSAM is a loose umbrella term which represents different positions or basis of inquiry: Afrofuturism 2.0 (and its several Africanist manifestations, i.e. Black Quantum Futurism, African Futurism, and Afrofuturismo), Astro Blackness, Afro-Surrealism, Afro-Pessimism, Ethno Gothic, Black Digital Humanities, Black (Afro-future female or African Centered) Science Fiction, The Black Fantastic, Conjure, Magical Realism, and The Esoteric. Although these positions may be incompatible in some instances, they overlap around the term speculative and design, and interact around the nexus of technology and ethics. 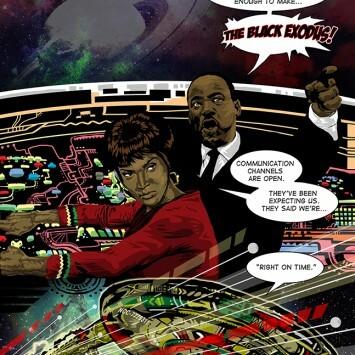 The current popularity of Afrofuturism can be attributed its progression through the lenses of the Black Panther narrative. The comic character of T’Challa, the Black Panther, was developed by comic artist Jack Kirby in the Sixties, during the Vietnam war, the African Independence struggle, and the Black Power and the Black Arts movement. Incorporating elements of magic and science, the Black Panther emerged as a figure who would interact with other heroes such as the Avengers or the X-men and regarded as the first archetypical figure of Afrofuturism in the comic medium and film. BSAM is currently on a European Tour with stops in Berlin, Rome, Bilbao and Birmingham: What can we expect at the events? The tour will be an opportunity to discuss what happened in Johannesburg, South Africa. A symposium is taking place that is a continuation of an article published by Design Indaba entitled Looking to Afrofuturism 3.0 that began the conversation of the transition of Afrofuturism 2.0, a diasporic Pan African initiative, to its adoption or interpretation by the scholars and creatives on the continent. The conference is co-hosted by the WiSER institute at the University of Witwatersrand in Johannesburg, the Black Speculative Arts Movement and convened by author, curator, and cultural theorist Bongani Madondo and myself. The title of the Joburg Symposium, Telegraph to the Sky: Towards Afrofuturism 3.0, is partially taken from the title of a book by iconic poet and journalist Sandile Dikene, and explores issues around political economy, artificial intelligence and the next revolution of production, digital technology and political mobilisation, African Art and hyper capitalism, and indigenous healing systems. The European leg of the tour will take place 10 days after the conference with the North American African diaspora and members of the African Diaspora in Berlin, Germany with its emerging Afrofuturist 2.0 community, scholars and creatives in Rome, Bilbao, and with the organisation AFROFLUX in Birmingham, UK.